Use the ‘pass the question’ strategy outlined below, to complete a brainstorm. Each group reports to the class, synthesising ideas collated by the class. Display brainstorm lists around the classroom. If questions emerge from this activity, record these and display them for reference throughout the unit. Consider the words ‘climate change’ and ‘global change’. List other words that students associate with them. For example: global warming, carbon pollution, greenhouse gas emissions, weather, the Greenhouse Effect. Investigate definitions and any associations the words may have. Why is it important to make distinctions between these terms? Present them with a range of resources, such as the Glossary in Resource 1.1 and the internet. Ask them to compare their research with their original ideas. Ask students to develop a concept map describing what they know about climate change, what it is, what it comprises, what it affects, and why it’s important. Step 1: Give each student 10 small cards. Step 3: On the remaining cards they write/draw other words that they consider to be important in relation to the topic. Step 4: The cards are arranged in a way that makes sense to the student. Step 5: Students then show the way these ideas relate to each other by drawing lines or arrows between the related ideas. Words or connecting phrases are written on the line or arrow to make the connection clearer. Step 6: Generalisations can then be formed on the basis of the connecting ideas on the concept map. Improve understandings about climate change. Invite students to use the following web based source material to find additional information about climate change. Please note that You Tube videos may not be accessible to students at school. 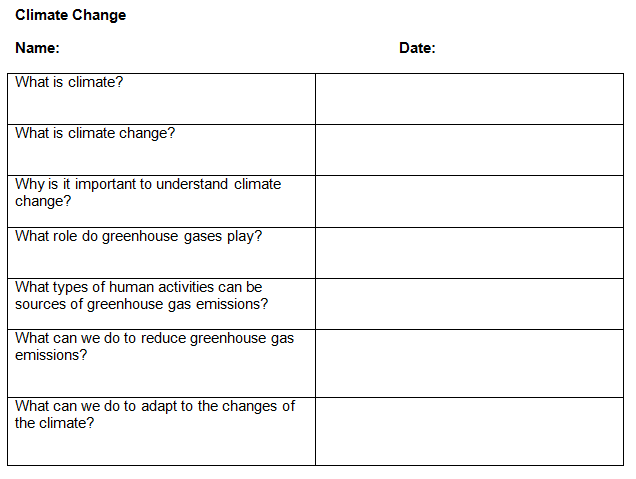 View excerpts and, in groups explore the concepts presented and list ideas on a retrieval chart documenting understandings about climate change.